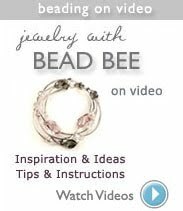 We appreciate that you have taken time out of your day to read our blog and visit our website at www.beadbee.com. Please send us a message with any questions you have or tell us about topics you would like to learn more about. Also, please sign up for our newsletter to get emails with sales and coupons. Have you tried Tool Magic yet? It's a gel-like solution that dries to a protective coating for your tools to protect wire work from dents and scratches. Along with good technique, Tool Magic will help ensure that your wire pieces will not be marred by tool marks. I coat my round nose pliers, flat nose pliers w/ tip and chain nose pliers. Ever since I discovered Tool Magic 5 years ago, I always keep a bottle in my tool box. Depending on how intensive your wire work is, the coating may last through several projects. If you work extensively in wire work or work on several pieces in one sitting, it is a good idea to have two sets of tools. When you need to re-apply Tool Magic to the tools you have been using, you have a fresh set of tools to use as you wait for the solution to set (2-3 hours) and you won't miss out on valuable production time, especially if you are working on a deadline like a wedding or craft show. 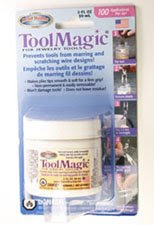 Click here to see instructions on how Tool Magic works or visit Bead Bee and ask for a demonstration. These elegant tiger ebony wooden beads will add personality to any project. 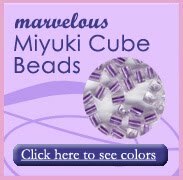 They provide the perfect neutral backdrop for enhancing colorful beads like Swarovski Crystals, Czech Glass or gemstone beads. 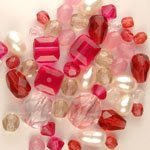 The elongated shape adds dimension and distinct style and works well with uniquely shaped beads or simple rounds and cubes. If your summer travels are bringing you to Orlando, add our store to your list of destinations. We are located in the beautiful Baldwin Park Village which has a distinct variety of shops & restaurants. You may be visiting the theme parks and attractions, but if you would like get a resident's view of Orlando, I would recommend downtown Orlando & Lake Eola Park. There is a farmer's market there every Sunday and a picnic on the lake is perfect for couples and families. 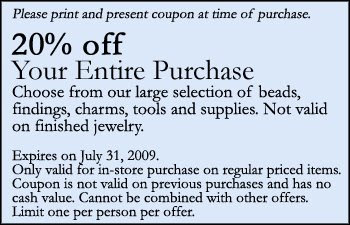 To make your visit sweeter, here is a Bead Bee coupon especially for our out-of-town and in-town guests! We look forward to seeing you! The color of this stone is a mix of rich green and brown hues that are sure to bring out your nature loving side. Green Opal is also known to bring peace, so surround yourself in positive energy with an easy summer look. One of my favorite chains is a fine cable chain. 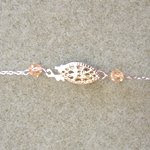 This chain is delicate, yet durable, and doesn't overwhelm the other beads and components of my design. However, it is impossible to get jump rings through the links to attach a clasp. To solve this problem, you can use crimp ends which are basically like crimp beads with loops on the ends. Simply insert the end of your chain into the tube and flatten. I have also discovered a much more elegant trick. Even the finest cable chain will work with 26 gauge wire. 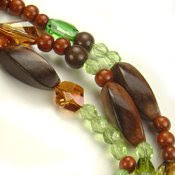 Find a coordinating bead, such as a 4mm crystal bicone and wire wrap the clasp to the chain. The end result is much nicer than using clumsy looking crimp ends that are out of proportion or a mismatch to the style of your piece. 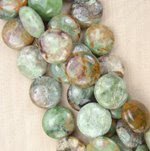 These green fire agate beads feature rich color and intricate veining - perfect for pieces to go with you summer clothing basics. 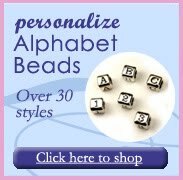 These beads have a matte, frosted finish that accentuate the texture and soften the color. Incorporate into long chain necklaces, a chunky choker or bold bracelet.